visit site buy propecia toronto What if you are not from a swimming background though want to be more competitive in the triathlon swim? One answer is to add more structure to your swim training. There are many triathletes whose goal for the swim is to “just get through it so that I can get on the bike”. Swimming is enjoyable to me. I have spent many hours reading books and blog posts and watching videos about swimming in order to be a faster swimmer. I have also gotten advice from my son, a former college swimmer, on how to improve my swim. As with most sports, improvement comes by developing better technique, a more efficient form, greater full body strength, and aerobic fitness. 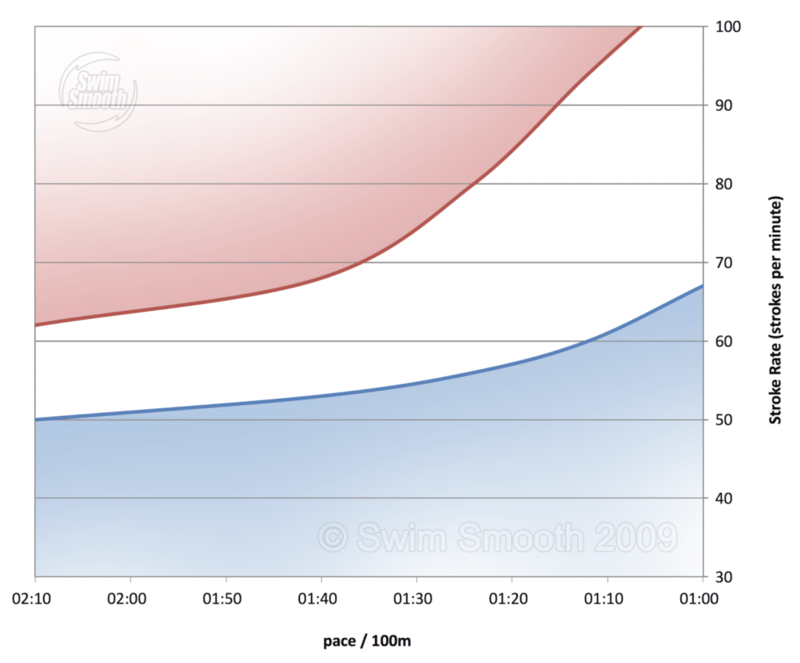 According to Swim Smooth, there is an ideal relationship between swim speed (time per 100 m) and swim stroke rate (strokes per minute). A swimming stroke that is too high (RED zone) hints at too short a stroke. On the other hand, a slow stroke rate typically indicates too much glide with each stroke and a tendency to create a hand position in the latter part of the stroke that causes one to slow. My swim currently falls in the upper left portion of the BLUE region. Using my FINIS Tempo Trainer Pro, I am training to increase my stroke rate while paying close attention to the catch phase. The FINIS Tempo Trainer Pro is a waterproof metronome. The choice of one of its three modes depends on the training plan. For example, one mode allow you to set a time per lap for use with interval training. I set the device to transmit an audible tone for each of the strokes in the targeted pace. For example, I set the Trainer to beep every 1.0 second for a stroke rate of 60 strokes per minute. The pace is adjustable in 1/100th of a second increments giving plenty of resolution for every situation. The small, waterproof device easily secures beneath a swim cap and transmits a clearly heard, audible beep. It floats in water to help avoid it being lost in the pool or open water. The Tempo Trainer Pro also comes with a clip for ‘dryland’ training. For example, it is used in bike (cadence) and run (foot turnover rate) training. The FINIS Tempo Trainer Pro includes a replaceable battery. I have had the device for more than five years and replaced the battery one time by taking it to a local BatteriesPlus store. My journey toward becoming a better swimmer continues by working to increase my stroke rate. With strength training and more structured time in the water, I am confident that I will be more competitive in the triathlon swim.